Wilner-Greene provides complete repair and calibration services for TSI PortaCounts — both newer and older models! Our N.I.S.T.-traceable repair and calibration services keep your PortaCount FIT Testers in working order and calibrated to meet all calibration requirements. We can usually repair and calibrate for a lower cost than the manufacturer. We'll also provide much faster turnaround (typically within 2 weeks), to minimize down time. Our experienced service technicians will calibrate your PortaCount quickly and certify that it's working properly. We service current models like the PortaCount 8038 — as well as older models like the PortaCount 8020! 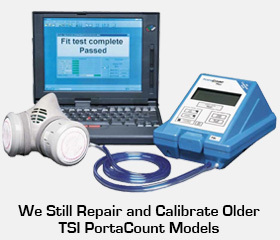 Have an Older TSI PortaCount That Needs Repair or Calibration? TSI no longer services some of its older PortaCount models — but we do! If you still use an older model like the TSI 8020, send it to us for repair and calibration! And we provide the service for less than the manufacturer used to charge! You don't have to replace your older PortaCount unit if it just needs a repair or calibration. For more information, call 1-800-634-4327 or email us.